Tangled roots and family secrets. A famous immigrant writer who died under mysterious circumstances. Accordions, polkas and potica. And now a new twist: My Year of Cooking Ethnically. It was Tuesday, my designated Slovenian cooking day. It also happened to be February 21. Mardi Gras. But there would be no home cooking this week. My husband and I were in the middle of a trip back east, visiting family in New York before we continued on to Rhode Island. We were feeling miserable and slightly queasy. Both of us fighting off the flu. Walking the streets of Manhattan, dragging our bags behind us, in a damp, bone-chilling cold we no longer knew how to face. On our way to my cousin's apartment on the Upper West Side, after spending several days with family on Long Island. It was past lunch time. We were definitely in need of some comfort food. We passed a New Orleans style restaurant. A fitting choice, perhaps. But we had just hosted a Louisiana-themed party back home, to celebrate the launch of Zydeco Nation, a new radio documentary about our music community in California. I didn't think this Manhattan restaurant could top my husband's offerings for the event, which included his trademark muffaletas, along with red beans and rice. Then I spotted another possibility across the street. Balkanika, a wine bar and restaurant. That sounded promising. We hurried over to take a look. Balkanika Restaurant made a tantalizing promise: Balkan and Mediterranean food in the heart of Hell's Kitchen. They even included Slovenia in the long list of cuisines we could sample. Inside, we found a comfortable, woody restaurant with a long bar in back. Not too crowded, since we had managed to arrive after the weekday lunch crowd. The menu was dazzling and varied. Too many choices, for diners in our weakend state. We spotted the lunch special: a glass of wine, a starter, and an entree for just $14. Hard to beat that anywhere, much less in Manhattan. I didn't notice anything designated as Slovenian on the menu, although I saw a couple of dishes I had made recently: stuffed cabbage and stuffed peppers. There were any number of exotic choices from Turkey, Albania, and Bosnia. 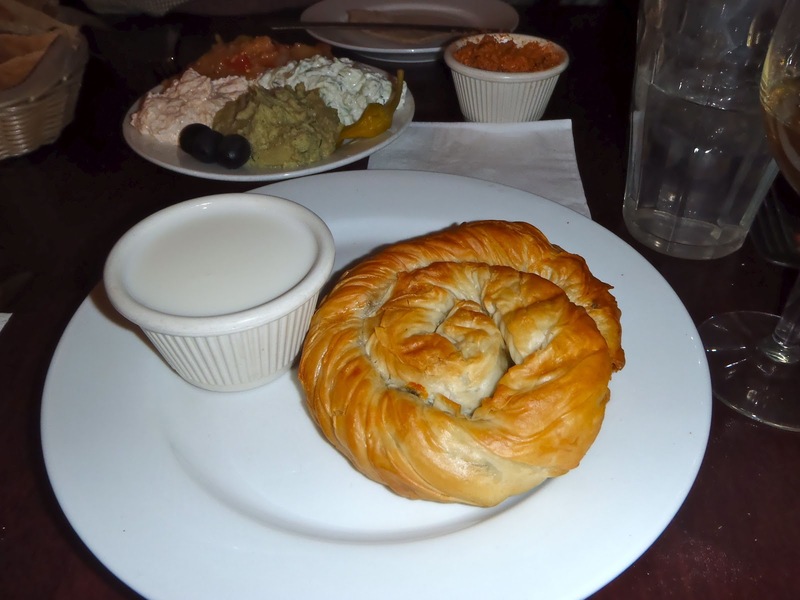 But I immediately zeroed in on the burek, one of the restaurant's signature offerings. Burek, a savory phyllo-wrapped pastry, is found all over the Balkans and the Middle East. The origins are probably Turkish. There are endless variations in the spelling, the filling, and the shape. The one constant is deliciousness. In the months before I began my Slovenian cooking project, I had been experimenting with making it myself, with store-bought phyllo. As usual, we decided to share. I chose the cheese burek. 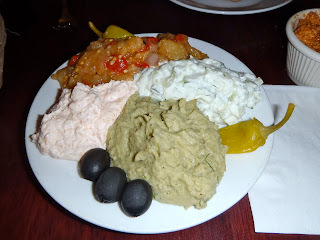 My husband picked out four selections for his meze platter. We each ordered the bean soup with beef to start. It was just what the doctor ordered. The soup was soothing and hearty. The cheese burek, in a traditional coiled shape I hadn't tried before, was mild and just tangy enough, with a filling of ricotta and feta cheese. It was served with a cup of thin, sharp homemade yogurt alongside. The assorted meze provided a nice counterpoint, with some unusual selections. The green fava bean spread, with the characteristic bitter edge, would have been tantalizing, if not for our slightly "iffy" stomaches. We really enjoyed that pinkish paprika walnut spread. The whole wheat pita was a welcome addition. And the glass of wine was good medicine, too. Highly recommended, if you find yourself in Manhattan and in need of unique and satisfying comfort food with a Balkan flair. I'm so going to eat here next time when I'm in NYC! I can't believe I didn't know about this place when I lived there. Yes, do check it out! We just came upon it by accident and would love to go back. Thanks, Greg. I just followed the instructions. Don't know how much more reviewing I'll be doing in New York, since that's not my hometown. But I'm happy to help spread the word about such a cool restaurant! You can upload a blog-specific photo if you prefer, and can change a few other blog settings there. Also, if you vote for a restaurant that you've reviewed on your blog, we now show your vote next to your post everywhere on our site. Also, you can review restaurants anywhere, not just in New York. We just listed New York as your hometown because that's the first review you have up on Urbanspoon. If you want us to change your hometown listing, just me know. Email is the best way to contact me. I can't deny it: I'm a late-in-life, born again Slovenka. It is surprising that it took so long, since I grew up in and around Cleveland, which boasts the world's second largest Slovenian population. But aside from our yearly potica-making ritual, my mother never talked much about her ethnic roots, either in America or in the tiny, beautiful Alpine land of Slovenia, once part of Yugoslavia. Her parents were named Kozlevcar and Adamic. My grandmother was a cousin of Louis Adamic, the famous leftist writer from the 1930's and 1940's. And that's all I knew, for most of my life, until my passion for the Cajun accordion brought me back. My first book, Accordion Dreams, came out a few years ago. Now I'm on a new journey, back to my own roots. Looking for answers—and perhaps a few good recipes along the way. Full name: Blair Kilpatrick. Psychologist, folk musician and writer, based in Northern California. Author of Cajun-Creole music memoir "Accordion Dreams" (Univ. Press of Mississippi, 2009.) 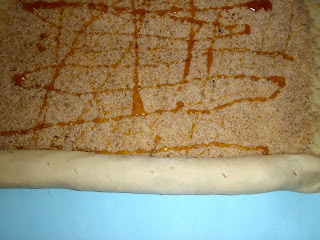 Now working on a family history/food memoir about my Slovenian heritage.